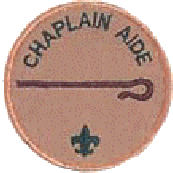 Assists the troop or team chaplain with religious services at troop/team activities. Encourages troop/team members to strengthen their own relationships with God through personal prayer and devotion and participation in religious activities appropriate to their faith (see note 1 below). Helps recognize troop/team members who receive their religious emblems. Makes sure religious holidays are considered during the troop/team program planning process. Helps plan for religious observance in troop/team activities. Helps promote annual Scout Sunday.